Have you ever tried to explain to a child why bad things happen if God loves us? 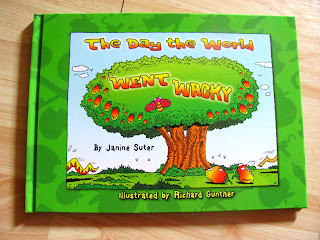 These questions can often be challenging to explain to young minds but MasterBooks new book"The Day the World Went Wacky" answers all those questions in a kid-friendly format. This original and entertaining rhyming book retells the story of Genesis 3 and what it means for us today. Using a unique combination of humor and apologetics, The Day the World Went Wacky tells the account of the Garden of Eden in a fresh and challenging way. Join the Moms of Master Books for a chance to win this amazing resource! full disclosure: i was provided with a copy of the book and puzzle to review, to share with my readers here, and at the Twitter party. all opinions are honestly my own.